Eighty percent of the medical malpractice claims that drive up the cost of healthcare are caused by miscommunication between primary care doctors, specialists, labs, EMS providers and hospitals that don’t know what’s in each other’s electronic patient records. And this has a significant impact on New Jersey employers, who pay the bulk of their employees’ health insurance premiums. 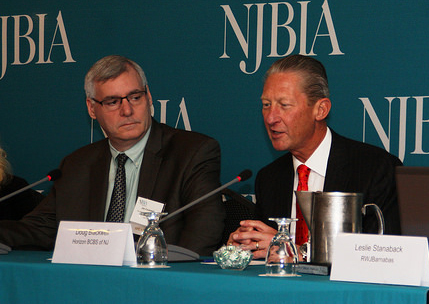 L-R: Jim Cavanagh, executive director of the New Jersey Health Information Network, and Doug Blackwell, senior vice president of IT & chief communications officer at Horizon Blue Cross Blue Shield of NJ, speaking at the NJBIA Healthcare IT Summit on Nov. 1. The challenge facing the healthcare industry today is “interoperability,” which is the industry’s term for making the various electronic data healthcare systems now in use “talk” to one another, McCrary said. Right now these electronic data systems are comparable to individual cellphones that can do wonderful things such as calculate numbers, take notes and snap photos, but are still unable to talk to one another because there is no network to connect the calls, McCrary said. The goal is to create the infrastructure that allows the community doctors to connect with each other and communicate with the hospitals, the labs, and the specialty-care doctors in order to create a “longitudinal patient record available to all clinicians across the state,” McCrary said. Employers will benefit because when doctors actually have a complete health history of their patients they’re going to be able to provide better, safer and lower-cost healthcare for employees, McCrary said. Horizon Blue Cross Blue Shield of New Jersey, the state’s largest insurer, has built its own private health information exchange with key partner providers because it is important to identify high-risk patients from a population health management standpoint in order to manage their healthcare delivery more effectively, said Douglas Blackwell, Horizon’s senior vice president and chief information officer. Jim Cavanagh, the executive director of the New Jersey Health Information Network implementing the state’s IT strategy for healthcare, said the interoperability of electronic health data is essential as the industry moves from a fee-for-service reimbursement model to a fee-for-value model that pays physicians based on outcomes, not just on the number of tests and procedures that are performed. Cavanagh noted the NJ Health Information Network completed its pilot program and is moving to go live statewide.